Vegan Butternut Squash Soup is warm, comforting and delicious. It will warm up holiday guests before the big meal on Thanksgiving! Thanksgiving is almost here, can you guys believe it? And I am sure everyone must have already started planning out their menus, I mean there’s so much to cook so planning is definitely required. 1. That’s a lot of food, one can’t be cooking all this in 1 day! 2. How do you store the leftovers? I mean I am pretty sure that no one can finish all the stuff on the table. I eventually realized that people do a lot of prep beforehand for Thanksgiving and that makes total sense. No matter how much you love cooking, you can’t be doing that all in a single day. Seriously how much time it saves when you can make things well in advance and then just enjoy the time with your friends and family without having to worry about the food! 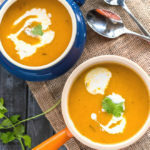 With temperature dipping down, soup must very well be on your Thanksgiving menu and if not, I insist you make this Vegan Butternut Squash Soup. It’s delicious, vegan and the best part? You can make it well in advance and freeze it in freezer bags. I don’t about you guys but for me the easiest way to make butternut squash soup is to roast it. Everything tastes delicious when roasted and also makes the whole process so easy. Simply toss the squash into the oven and you are done. Once the squash is done, you add it to a pan with onion, garlic and some spices and let it all simmer together and then blend. I also add some coconut milk to make it creamy. If you are making this soup for Thanksgiving, simply let it cool down and then transfer it to Freezer Bags. I used quart size to freeze individual servings. You can freeze this soup 3 to 4 weeks in advance. On the day of Thanksgiving, remove the bags from the freezer and place them in simmering water directly. Once the soup is nice and warm, transfer to the serving dish! So easy right? 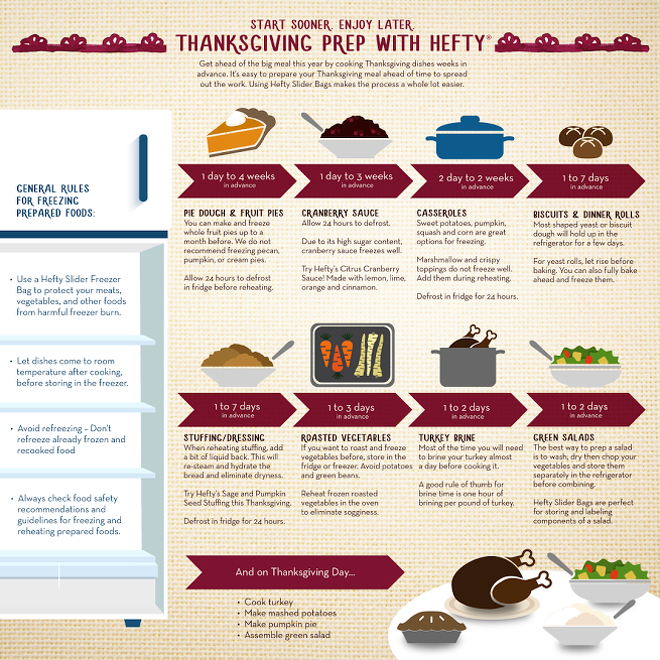 And that’s not all, there are some amazing tips to store and freeze Thanksgiving leftover. Preheat oven to 425 F degrees. Cut squash into half, remove the seeds and then brush the inside and outside with some oil. Place the squash pieces, cut side down on a baking sheet lined with silicone mat or aluminium foil. Roast for around 45-50 minutes or till it’s nice and soft. Once roasted, peel the skin (it would come off easily) and remove the flesh in a bowl. Set aside. To a pan on medium heat, add 2 teaspoons of oil. Once the oil is hot, add onion and garlic and saute for 2 minutes or till the raw smell goes away. Add the roasted squash pulp and mix. Also add dried rosemary, red chili flakes and salt, pepper to taste. Mix till everything is well combined and cook for 2 minutes. Add water or vegetable broth and mix. Let the soup simmer for 10 minutes. 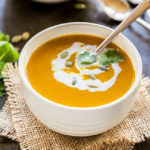 Using a immersion blend, puree the soup (or remove soup from heat, let it cool down a bit and then puree in batches using a blender) to desired consistency. Add coconut milk and let it simmer for 5 additional minutes. Serve the vegan butternut squash soup hot! If you making this for Thanksgiving, simply let it cool down and then transfer the soup to Freezer Bags. I used quart size to freeze individual serving. 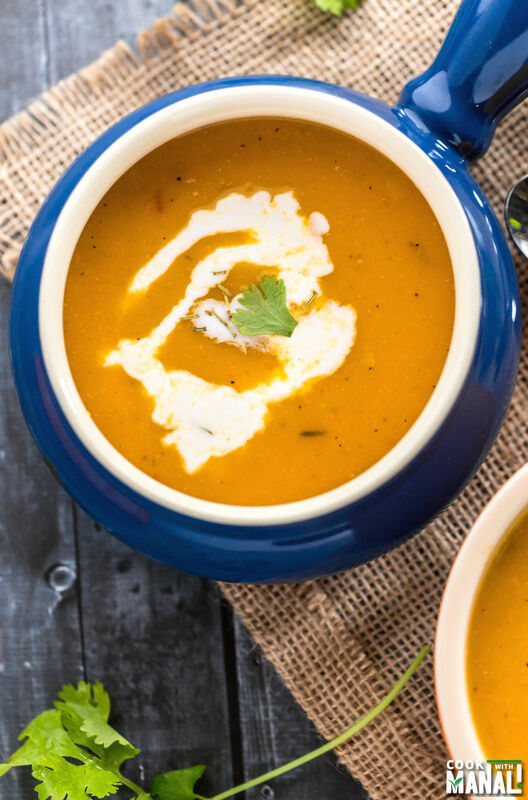 If you’ve tried this Vegan Butternut Squash Soup Recipe then don’t forget to rate the recipe! You can also follow me on Facebook, Instagram to see what’s latest in my kitchen! Vegan Butternut Squash Soup is warm, delicious and comforting! Cut squash into half, remove the seeds and then brush the inside and outside with some oil. Place the squash pieces, cut side down on a baking sheet lined with silicone mat or aluminium foil. Roast for around 45-50 minutes or till it's nice and soft. To a pan on medium heat, add 2 teaspoons of oil. Once the oil is hot, add onion and garlic and saute for 2 minutes or till the raw smell goes away. Add the roasted squash pulp and mix. Also add dried rosemary, red chili flakes and salt, pepper to taste. Mix till everything is well combined and cook for 2 minutes. Add coconut milk and let it simmer for 5 additional minutes. Serve the roasted butternut squash soup hot! Adjust the consistency of soup to preference. You can add more water for a thinner consistency. I can’t believe that Thanksgiving is almost here…where has the time gone? This soup looks delicious, Manali! I love how warm and comforting this is! Perfect for the season! No lie, I actually store Hefty because their products hold everything with no leaks. I freeze baked goods in their bags all the time! I’m crazy about butternut squash soup! This looks perfect, Manali! I love this butternut squash soup! and love that it’s vegan! I love soups like this but, like you, I don’t like using a lot of cream, or any cream at all! I love this! beautiful! Butternut squash soup is THE BEST! I like that you made a vegan version. Sometimes soups laden with a lot of cream don’t sit well on my stomach. So, this is a great alternative! This soup looks amazing, Manali! It’s been a bit (unseasonably) warm here lately, but the cold weather is coming…and when it does, I’m going to want a big pot of this soup waiting on the oven! Girl, having leftovers is one of the best parts about Thanksgiving! It’s so cool that last year was your first Thanksgiving! I can only imagine how overwhelming it must have been. 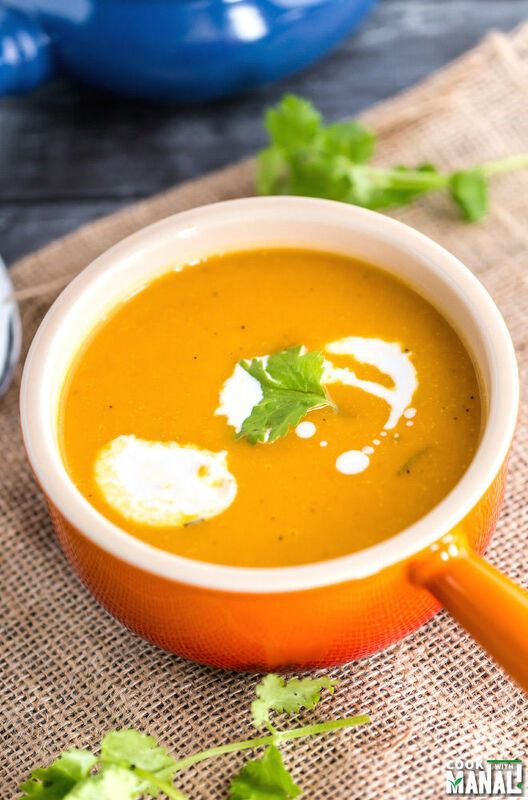 This butternut soup would be a perfect addition to any holiday meal! It looks fantastic! 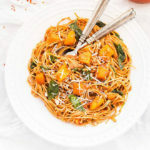 Butternut Squash looks absolutely inviting .. That’s a sheer coincidence.. we cooked up some Butternut squash too and just loved it ! We are on the same culinary wavelength, Manali. Your pumpkin soup looks so very creamy and comforting. I would never think to put soup in plastic bags to store, but that is definitely a great idea. 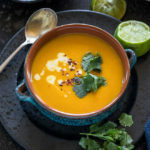 I adore butternut squash soups, and this one looks so cozy and delicious! 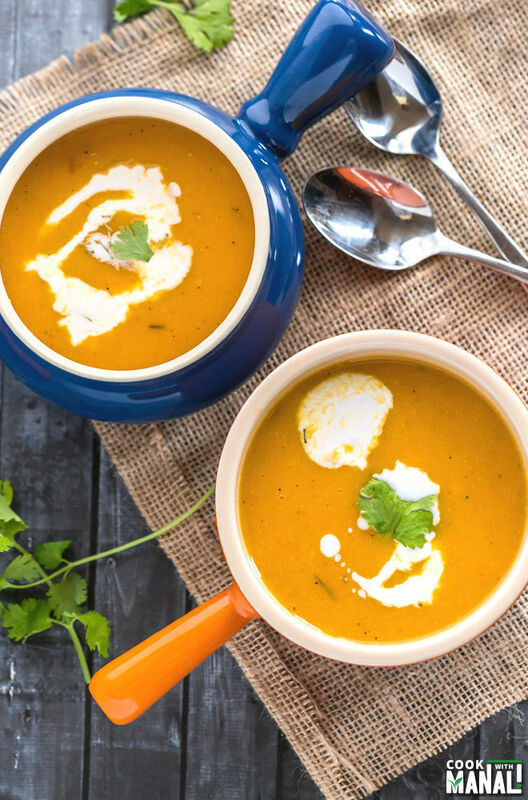 Hi Manali, pumpkin makes delicious soups, with a touch of chilli than is something out of this world! This butternut squash soup looks delicious, Manali! What kink of coconut milk; boxed, canned full fat, or canned light? I used canned full fat in this recipe. Edited that in the recipe. Made this today for dinner. It was a big hit! Making more tomorrow since I cooked extra squash. So delicious! Can I use frozen squash? And what would the equivalent be to 1 fresh squash ? Would I bake the frozen squash first, I have a Vitamix with a soup level. yes frozen squash should work, I would probably just roast it for some extra time since it’s frozen..not sure what would be equivalent to 1 fresh squash since squash are also different in size..this is what I found online: A butternut squash weighing 2 lbs. yields about 3 cups of diced squash after you’ve removed the peel and seeds. A small butternut squash weighs around 1 lb. and yields 1 to 1 1/2 cups diced squash.